New findings at the Tasmanian Institute of Agriculture (TIA) have proven the hard work behind our world-class beer and meat industries does not stop at the production line, with ground-breaking research cracking an age old beer mystery and the secret to the tastiest, healthiest lamb chop. For many years, beer brewers have been stumped as to why yeast was sometimes found clumped together early in the fermentation process, ruining thousands of batches of beer each year. To the joy of beer brewers and drinkers everywhere, the team at TIA have solved the 40 year mystery and are now working on a solution. “We discovered that this phenomenon, which is known as premature yeast flocculation (PYF), occurs in the brew when the barley grain is carrying a certain naturally occurring fungi,” team member Dr Mandeep Kaur said. Australia produces on average 2.5 million tonnes of malting barley per year, which equates to 30 per cent of the world’s malting barley trade. With the ability to prevent product wastage locally and potentially internationally, the TIA team is now developing a cost-effective, accurate and rapid DNA test to identify if the fungi are present on barley malt, through funding from the Grains Research and Development Corporation and Joe White Maltings. Meanwhile, omega-3 rich lamb could soon be on the menu, thanks to TIA research that has found feeding sheep polyunsaturated oil supplements like canola, rice bran and flaxseed oil produces lamb that is both healthier and tastier. Red meat does not normally contain the omega-3 fatty acids that are beneficial for human health, but this discovery could open a potential new market for sheep graziers. 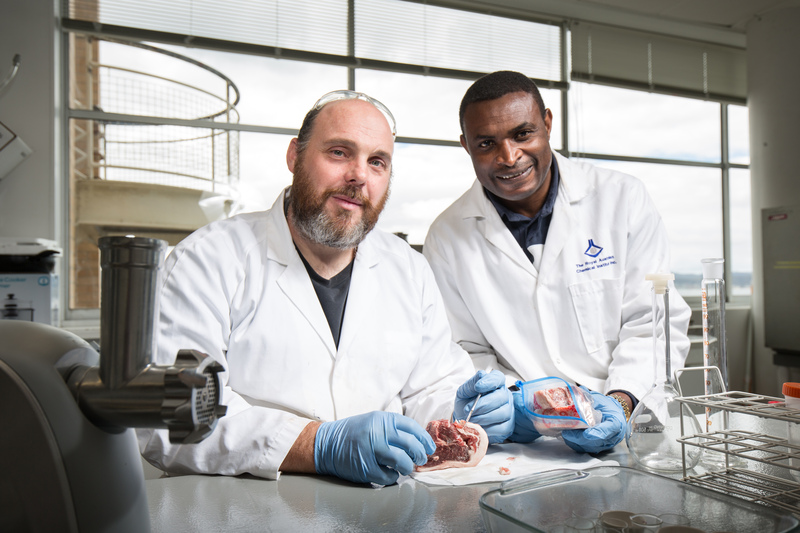 TIA Associate Professor in Animal Science and Genetics, Aduli Malau-Aduli, is leading the research that has been assessing the impact on meat from sheep fed pellets containing five per cent polyunsaturated oils. “The results are very promising and we have found that not only does the meat contain high enough levels of omega-3 fatty acids to deliver health benefits, but the bad fats, or saturated fats, are also significantly lower in the meat,” Associate Professor Malau-Aduli said. TIA research team member, PhD student Aaron Flakemore’s goal is to see lamb on supermarket shelves with a Heart Foundation Tick sticker. “There is quite a bit of diversity between sheep – some sheep convert the oil to unsaturated fats better than others. So there is potential to start selecting and breeding sheep that are better at making healthy fats,” Mr Flakemore said. The research is supported by CSIRO, CopRice Feeds and the Australian Wool Education Trust.